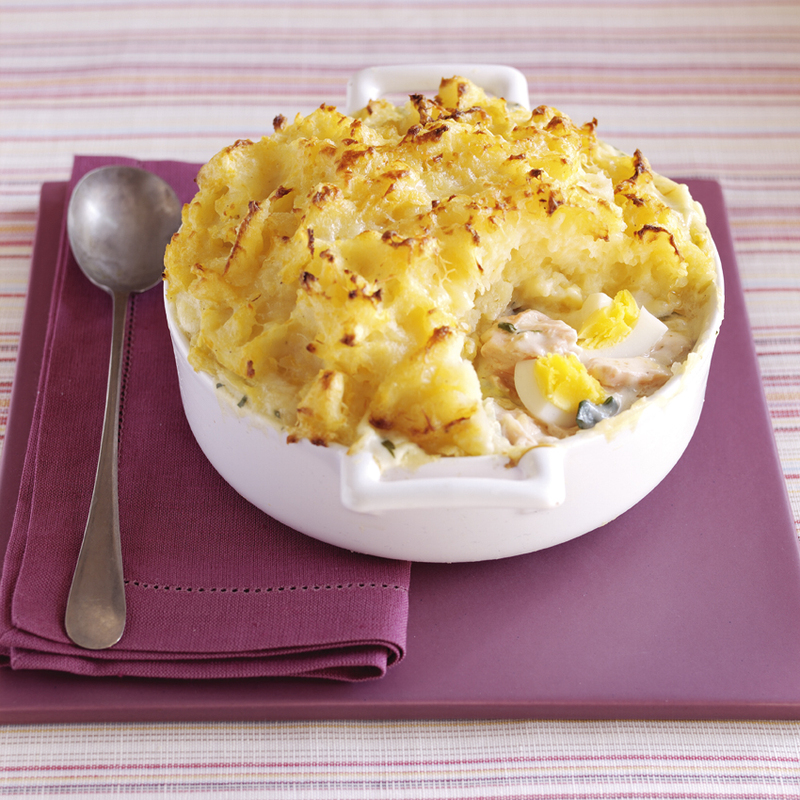 Delicious and easy, a fish pie anyone can make! 1. Place the swede in a saucepan, cover with water and bring to the boil and then leave to simmer for 5 minutes. Add the potatoes to the pan, cover again and simmer for a further 20 minutes or until the vegetables are tender. 2. Meanwhile, pour the milk into a sauce pan and add the salmon. Bring to the boil, then reduce the heat and simmer the fish gently for 4-5minutes or until the salmon is cooked. Remove the pan from the heat and use a slotted spoon to lift the fish out of the milk. 3. Remove any skin from the fish and flake the fish into large chunks into a 2 litre (3 1/2 pint) oven proof dish. Add the quartered eggs to the dish. 4. Mix the Cornflour with 3 tbsp water. Bring the milk to the boil and slowly pour in the Cornflour, stirring well to give a smooth sauce. Simmer the sauce for about 1 minute until it’s thickened, then stir in the parsley and season it to taste. Pour the sauce over the fish in the dish. 5. Preheat the oven to 200°C/400°F/Gas 6. Drain the vegetables well and add the melted butter and seasoning. Mash the vegetables until smooth, then spoon them over the top of the fish mixture. Sprinkle the grated cheese over the top. 6. Bake the pie in the centre of the oven until the top is golden in colour and the filling is starting to bubble. Remove form the oven and serve with green salad.